Libby Dowley of the Skiers scores the first of her two goals in Aspen's 16-0 win over Steamboat Springs on Wednesday. Dowley and the Skiers will host Grand Junction at 4 p.m. today in a key conference game. It’s showdown time for the Aspen High School girls lacrosse team. The Skiers, fresh from a resounding 16-0 victory over Steamboat Springs, will host Grand Junction at 4 p.m. today at the AHS turf field. 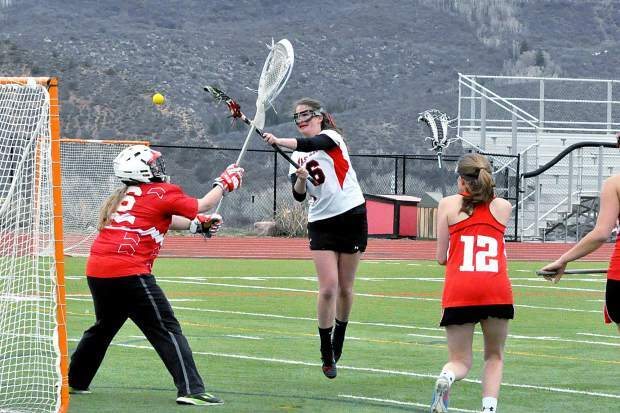 The Aspen girls beat Grand Junction 16-10 on March 18 in Grand Junction. The Tigers are 4-5 overall and 2-2 in the Mountain League, including a 15-8 loss to rival Fruita Monument on Wednesday. The Skiers improved to 7-2 overall and 3-0 in league. Also, the career-best for AHS senior Ryley Sutton in the girls 3,200-meter run is 12:36.49.